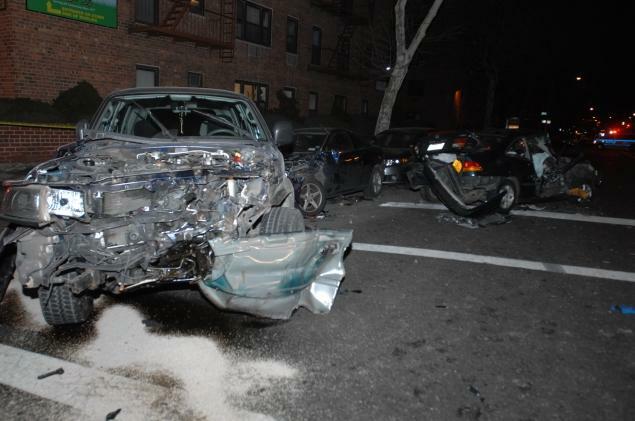 A car accident that left 7 people injured in Queens, NYC, this weekend is being investigated by NYPD Internal Affairs. Joseph Barriga who was driving a car even though his license had been revoked after 20 suspensions was spotted by the Queens Gang Squad after he blew a stop sign. The cops who were driving an unmarked car tried to pull him over but instead Bariga hit the gas and the cops started to chase him. After a minute of chase the cops were told by their superior to terminate the chase. Two minutes later Barriga blew a red light and slammed into a car with five people in the car. It is not clear if the cops stopped the chase when instructed but they were a block away from the car when the accident happened. Barriga was charged with reckless endangerment, aggravated unlicensed operation of a motor vehicle and several other violations. No disciplinary actions have yet been taken against the cops involved.